Last weekend was the Rose City Yarn Crawl. If you are not lucky enough to live in a city that has a yarn crawl, its much like you’re basic pub crawl. You hop from shop to shop and taste a bit at each one. In Portland, they really go all out. Fifteen shops participated. Each shop offered a free pattern with purchase designed by the shop. The patterns are now available here. Most had trunk shows featuring local dyers, spinners, shawl pin and stitch marker makers, etc. There was a Mystery-knit-along and Mystery-crochet-along leading up to the crawl, and at each shop you could enter to win a prize basket. If you visit all 15 shops during the crawl, you get entered to win the grand prize! Those are my mother and I’s finished “Passports” proving that we made it to all 15 shops. No prize baskets for either of us, but it was a lot of fun. The crawl is four days long, Thursday – Sunday, but because I was working we did the whole thing over the weekend. In past years there has been even more shops participating, but a few have closed down. Here is the upclose shot if you live in the PDX area and want to see all the shops in the area. We collected all the free patterns and not a small amount of yarn. I also got a shawl pin, some project bags, stitch markers, and some purchased patterns. I haven’t had the time to take individual photos yet, but here is a photo of the haul all together. I want to cast on something new so badly! I’m still trying really hard to wrap up my lingering WIPs though, so I’m hoping my willpower holds out just a little bit longer. I put a new sweater on the blocking mat this afternoon (I’ll show you next post!) and if I can get two more projects complete I’ll feel good about casting on something new. I’ve been able to take my WIPs from 14 down to 6, and I’m trying really hard not to let it balloon up again. But with this pile of awesome looking up at me, how can I not! 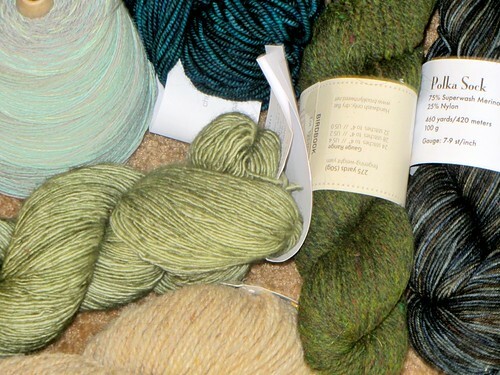 The first weekend in March was the Rose City Yarn Crawl. The crawl celebrated it’s third year this year and was extremely fun. 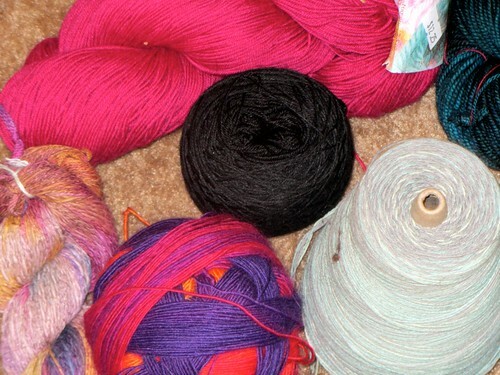 Basically, 19 yarn shops in the Portland area (yeah, I am spoiled enough to live in a city with 19 yarn shops) go through a lot of trouble to make the weekend amazing. There are special trunk shows and demos, most of the shops have yummy snacks, every shop designs a knitting pattern that you get free with purchase, and there is a drawing for a giant prize basket at every store. Then there is a special drawing for the people who manage to make it to all 19 shops in one weekend. I did not go to all 19 shops. I went to 12. In one day. And Ryan came with me to all of them. I know. I am a bad girlfriend and he is an excellent boyfriend. I did not buy something at every store, but I did walk away with quite a loot. In one store we ran into a Spectra that had been knit up using Zauberball and a black yarn for the border. Ryan was extremely taken with it and questioned my ability to duplicate it. Confident in my knitter-fu I boasted that I could absolutely duplicate the scarf if I had the same color of Zauberball. Ryan snatched up the last ball of the same color and bought it for me. The gauntlet has been thrown down. That multi-colored ball (that’s a “Zauberball”) and the black are being transformed into Spectra as we speak. 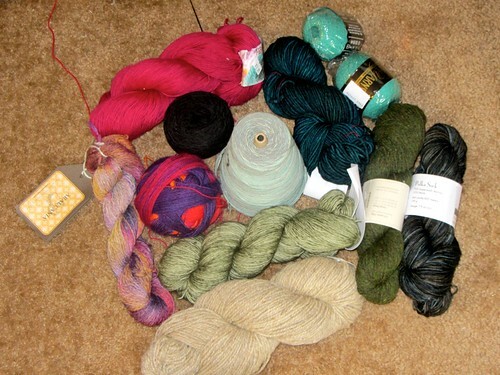 I don’t know how I’m going to keep up with shawl club, Spectra, and For Yarns Sake knit-a-longs. At this point keeping up is probably impossible, I’ll just have to try not to fall too far behind.